Since modern graffiti first made an appearance in the 1960’s the debate has raged; is it a form of artistic expression or a simple act of vandalism? In a 2016 article of the Peachland View (while dealing with skate park graffiti) the district’s director of community services, Cheryl Wiebe stated, “Uninvited art is vandalism, regardless if it is on a sign or skate park.” Even in a location with a modest population of 5000, tagging is common. 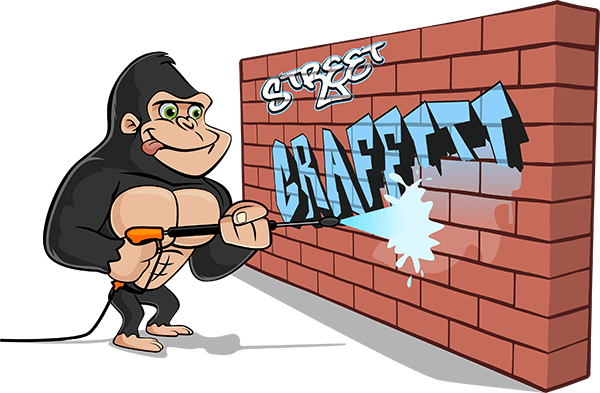 That’s why Gorilla Property Services now offers Peachland Graffiti Removal to home and business owners alike. We all know graffiti can look unappealing, particularly when neglected. Research shows that ignoring the issue just encourages the graffiti artists to come back. Vandals want their work seen. Therefore, it stands to reason they’ll move on if removal is swift and continuous. Our Peachland Graffiti Removal Program is tailored for just that. As a deterrent, our fully trained and uniformed Gorilla technicians will regularly patrol your property. If taggers are aware an area is being watched, they are more likely to choose another target. When removing graffiti, the cleaning compounds we use are non-corrosive and eco-friendly. The result being your home or business will look new and inviting again. Paint bakes into façades over time. Why gamble with overlooked paint when our Gorillas will remove it quickly and efficiently. This can cause overshadowing, which is when (even after removal) traces of the tag remain. That’s no problem for our Peachland Graffiti Removal experts. Gorilla technicians can even colour match paint if necessary! Technicians even keep colours on file for future use.